A father Adam (Julien Nicholson) and his young daughter Alice (Lowena McDonell) are living a secluded life in their remote woodland home. Alice is coping with the amputation of her hand while they’re both adjusting to the transitional loss of her mother. When their isolated existence is interrupted by a young battered woman Erika (Haydée Lysander) and her younger mute brother Paul (Marc Puiggener) knocking at the door, their lives and deaths will never be the same. If you hear this film has a robotic arm, a talking dog and time travel and you’re still intrigued, you are in for a treat. Writer and director Sadrac González-Perellón shoots a beautiful movie at a gorgeous home in a charming wood setting. González-Perellón and his DOP Iván Romero show they know how to make art on film in González-Perellón’s first English feature made on more than a dollar budget. The films beauty sucked me into the slow build from the beginning. For all the simplistic yet stunning visuals the movie provides the most refined artistry is in the role of Alice as played by Lowena McDonell. The young actress’s performance is the center stone of the film, providing the foundation for it to hold itself up on. 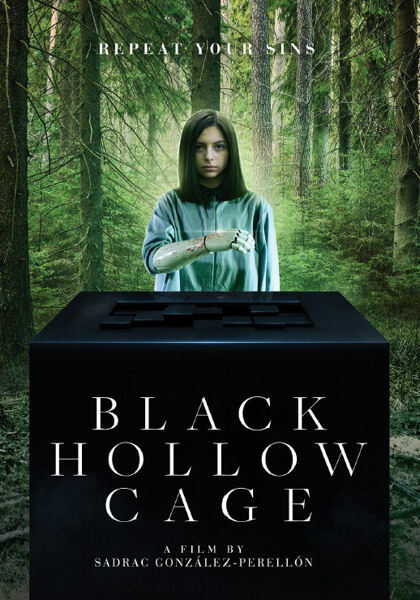 There isn’t a full wraparound understanding of any character in the film but Black Hollow Cage leaves beauty in the mystery of the story untold. The interactions between father and daughter are powerful and emotional and both Julien Nicholson and Lowena McDonell excel at their roles. The stylized filming, off paced dialogue and unexplained suspense storytelling mirrors last years The Killing of a Sacred Deer, only executed better while being far more entertaining. Those who require a backstory and answers may leave unrequited. A lot is thrown at the screen without explanation of its existence. The allure of this film isn’t in a robotic arm, talking dog or a black box in the woods; it’s the exploration of humanity which is all sold in the performances.